Better late than never (hey, it's summer and I've been at soccer tournaments! ), it's the monthly Top 10! 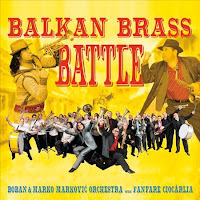 Shooting to the top of the chart is the embarrassment of Balkan Brass riches featuring two of the best (and fastest) contemporary brass bands. Also new this month: the Afro-rock guitar stylings of Lobi Traore, the worldly funk of The Funk Ark, the sublime Rough Guide to Sufi Music, Klezmer pianist Roger Davidson, and unusual Cuban music from The Creole Choir of Cuba. Along with the holdouts from last month, it's another strong group well worth exploring. Click the links for sounds and purchase options.